[223 Pages Report] The market for in-mold labels is projected to grow from USD 2.58 Billion in 2015 to reach USD 3.23 Billion by 2020, at a CAGR of 4.54%. The report aims at estimating the market size and future growth potential of the in-mold labels market across different segments such as material, technology, end use, printing technologies, printing inks, and region. Globally, competition in the in-mold labels market is growing considerably owing to the improvement in labeling technologies such as 3D printing and thermoforming. Label convertors are keen on developing innovative labeling solutions that can withstand harsh weather conditions such as extreme temperature and abrasion. The base year considered for the study is 2014 and the market size is projected from 2015 to 2020. The research methodology used to estimate and forecast the market size included the top-down approach. The total market size of the in-mold labels was calculated, and accordingly, the percentage was allotted to different sectors in each of the segments. This allotment and calculation was done on the basis of extensive primary interviews and secondary research. Primary research involved in this report includes extensive interviews with key people such as CEOs, VPs, directors, and executives. After arriving at the overall market size, the total market was split into several segments and sub segments. These data triangulation and market breakdown procedures were employed to complete the overall market engineering process and arrive at the exact statistics for all segments and sub segments. The breakdown of profiles of primary respondents is depicted in the figure below. The in-mold labels ecosystem comprises in-mold labels manufacturers and vendors such as CCL Industries Inc. (Canada), Constantia Flexibles Group GmbH (Austria), Huhtamaki Group (Finland), Coveris Holding S.A. (U.S.), Cenveo, Inc. (U.S.), and government and national associations such as IMDA, which helps the manufacturers in the development and growth of in-mold label products, technologies and markets. 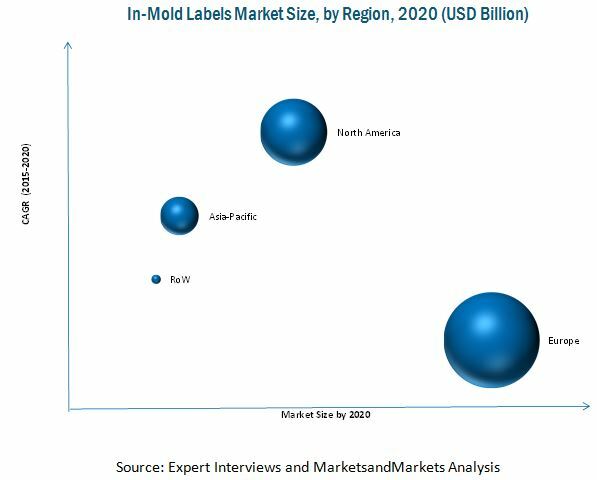 MarketsandMarkets projects that the market for in-mold labels is projected to grow from USD 2.58 Billion in 2015 to USD 3.23 Billion by 2020, at a CAGR of 4.54%. The market for in-mold labels is growing due to innovative developments in the industrial sectors, growth in the food & beverage industry, and rising demand for eco-friendly and high-performing labels. Increasing awareness among consumers about the sustainable labels and their pace of adopting products is one of the biggest factors that led to the increase in the demand of in-mold labels, especially in the emerging Asia-Pacific and Latin American regions. The in-mold labels market is segmented on the basis of material, technology, end use, printing technologies, printing inks, and region. On the basis of material, polypropylene (PP) held the largest market share, in terms of both volume and value. It has become an essential labeling material because of its effective moisture-resistant properties. It is used in in-mold labeling of various consumer and industrial products such as foods, bar code labels, and retail labels. Injection molding technology was the most widely used in-mold labels manufacturing process among other technologies, in terms of both volume and value. The majority of in-mold labels are used in injection molding applications as they help in providing a three-dimensional effect to the labels on various products such as food & beverages, cosmetics, and automotive parts. Based on printing technologies, flexographic printing held the largest market share. This printing technology allows printing on a wide variety of both porous and nonporous surfaces making it easier to mold various kinds of polymers. On the basis of printing inks, UV curable inks held the largest market share, in terms of both volume and value. The reason for this dominance is its chemical- and abrasion-resistant properties as the in-mold labelling process is carried out under high temperatures. On the basis of end use, the market is segmented into personal care, consumer durables, food & beverage, and automotive. The food & beverage segment accounted for the largest market share in 2014. This growth is attributed to the increasing consumer awareness about the trends related to packaged food and the rising consumption of containers and bottled packaging. On the basis of key regions, the market for in-mold labels is segmented into North America, Europe, Asia-Pacific, and the Rest of the World (RoW). North America is projected to grow at the highest rate from 2015 to 2020, due to presence of key players in the market and the changing government policies about sustainable labels which has impacted the performance of the in-mold labels market. Mergers & acquisitions was the major strategy adopted by most players in the market. Companies such as CCL Industries Inc. (Canada), Constantia Flexibles Group GmbH (Austria), Huhtamaki Group (Finland), Coveris Holding S.A. (U.S.), Cenveo, Inc. (U.S.), Fuji Seal International, Inc. (Japan), and Multicolor Corporation (U.S.) were the key players who adopted this strategy to increase their geographic reach and product offerings, to increase the customer base, and to stay ahead of competitors. Companies aim to serve the market efficiently by investing in research & development activities and introducing new products to keep up with changing consumer wants and needs. There are certain factors prevailing in the market that hinder the growth of this industry. Lack of awareness about various types of labeling techniques factors in decreasing the demand for this type of labels. Varying environmental mandates in terms of printing on labels across different regions, and increasing cost of raw materials are significant challenges faced by manufacturers in this market. 12.2.6.2.1 PE Segment to Grow at the Second-Highest Rate By 2020 in the U.K.
14.7 Fuji Seal International, Inc. Figure 49 SWOT Analysis: CCL Industries, Inc. Figure 55 SWOT Analysis: Coveris Holding S.A. Figure 57 SWOT Analysis: Cenevo Inc.